1. Pilates is just stretching. Pilates primary purpose is to build strength and muscle mass, not to stretch. The methods Pilates utilizes to build such strength, e.g., working at the body’s center or core first, working a muscle through a full range of motion, eccentrically releasing a muscle, will create a longer and leaner muscle. So you will develop strong and flexible muscle mass in Pilates. 2. Pilates is the same as yoga. Pilates and yoga share a few traits: they both focus on core strength and they are mind-body exercise regimens. However, the practice of Pilates and the practice of yoga are different. Yoga is more pose-based while Pilates is more movement-based. Yoga is thousands of years old and is based in a spirituality while Pilates is a hundred or so years old developed by one man’s deep study of anatomy and exercise regimen. Many people enjoy both forms of movement, while others prefer one over the other. 3. Pilates is only for girls and/or dancers. As I already mentioned, Pilates was started by one man, Joseph Pilates. He was an avid athlete who developed a philosophy or approach to the body as well as a series of exercises and equipment that we still in use today with minor modifications. Due to the proximity of his first studio to the theatre scene in New York City, many injured dancers and actresses found their way to him for injury recovery, and the reputation of Pilates being for women has lasted ever since. 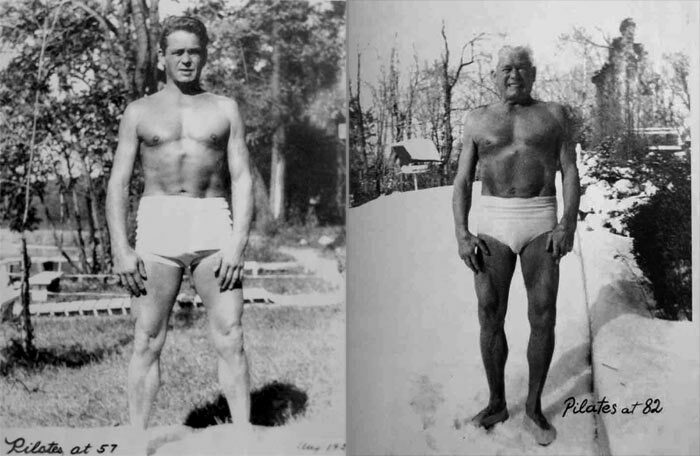 If you doubt Pilates’ ability to build a masculine physique, just look at a picture of its founder. 4. You need to be in shape already to do Pilates. The philosophy of Pilates is to build strength at the center of the body first and then to progress to outer muscles. Due to its progressive nature, Pilates is the best exercise choice for individuals starting from ground zero in their health journey. Wherever you’re at, Pilates will help you get where you are going! 5. You need to be flexible to do Pilates. Pilates will give you flexibility. Tension or tightness in the body occurs when superficial, exterior muscles are doing too much, and they never get a chance to turn off. Our central, or core muscles, should be doing their fair share of the work. If they don’t, the outer muscles go into overload and stay “on,” creating permanent tension. To create a long-term, permanent release of those outer muscles, we must create true strength at the center of the body (through Pilates)! Then the outer muscles will finally get to take a break and release their tension. So don’t wait to get flexible to do Pilates. Do Pilates to create true flexibility.